The custom projector interface is a result of the in-house fabrication capabilities of DT Mounts and enables the projector to be fixed directly to the MMD quickly, easily and accurately straight out of the box. The two-part system allows the basic frame to be installed during first fix of the project and if required plastered in. 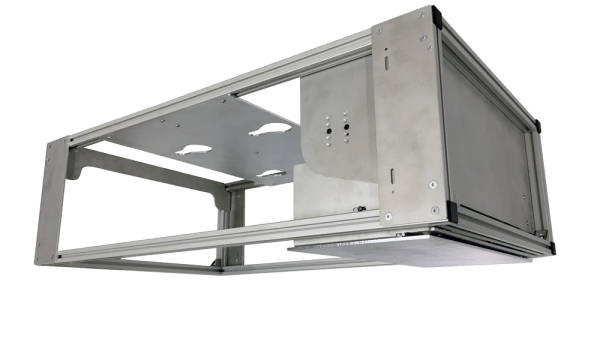 The Mirror module contains all the lift mechanism and controls and is simply fitted on simple location slots for final installation and commissioning. Featuring DT mounts Position Logic System (PLS) makes it straightforward to set exact stops and closed positions for simple recall via contact closure of RS232.